Carroll Street in Perry will be filled with Christmas lights, holiday music and refreshments Friday at the Coffee Cup. The event, which is from 6 p.m. to 8 p.m., is being sponsored by Moulliet Productions. According to a flyer, there will also be a chance to ride around the town square on Engine 21 from the Perry Fire Department. For more information, please call Gary Mouillet, a co-owner of Coffee Cup, at 478-224-5282. 250 folks plus their best friends are in Perry this weekend. Dogs and humans have paired up to compete in the UKI Open. It's an agility competition. You can think of it in terms of racing. The Peach Cluster dog show is put on by the American Kennel Club every year. That's like NASCAR but think of this level as Formula one. Welcome to the UKI US Open of agility, where treats are plentiful but prize money for winners is scarce. Jan Padgett and her husband run the show, and there is a perk to peaking at the right time. "No paychecks, no champagne but we give some ribbons and medals," she said. "Winners will go to the World Championships is in Great Britian this year." Hence the name. But to get across the pond, the pooches must perform some tough stuff. Well, it's tough if you're a dog. A lot is happening this weekend at the Georgia National Fairgrounds in Perry. Comic-Con, The southeast rodeo and the Royal Alpaca Challenge. Jay Reeder with the Georgia Alpaca Association says there's something in store for everyone at the Royal Alpaca Challenge. 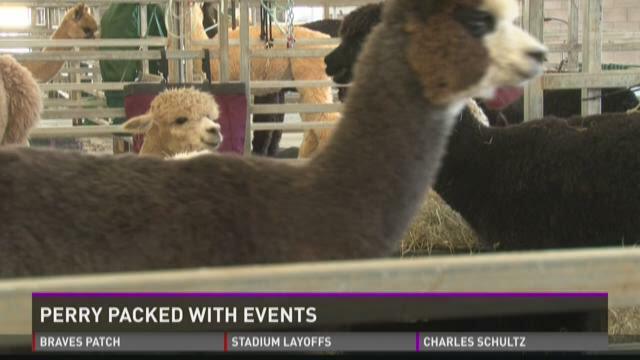 "An alpaca show that includes not only the showing of the alpacas for confirmation, fiber, and that kind of thing, but also plenty of activities for the family," said Reeder. More than a half million people visited this year's Georgia National Fair. setting a new record. Fair officials say excellent weather helped push the attendance to 501,628. Hundreds of students from Central Georgia gathered at Perry High School Monday morning for the annual Probe College Fair. Around 70 colleges were on site to speak with parents and students about admission requirements, scholarships, and campus life, among other things. Many of the students, including Jamir Johnson, said the fair helped to simplify their search. "I haven't quite decided yet. I have a couple in mind, though. I'm just really looking for a college that has a good law program and then a good student to teacher ratio," said Johnson. Auburn University, Savannah College of Art and Design, Berry College, and Georgia State University were some of the schools that took part in the event. On Monday, we reported that the Federal Aviation Administration had approved a no-fly zone over the Georgia National Fairgrounds. On Tuesday, the fair and the FAA confirmed that those flight restrictions were never approved. The fairgrounds told 13WMAZ this month that the FAA had approved what's called a "notice to airmen" or NOTAM. That would restrict certain aircraft, like drones or helicopters from flying within two miles of the fair and up to 3,000 feet. Fair Public Safety director Stephen Shimp told 13WMAZ on Tuesday that they were still waiting for approval then.